Durban–based Van Dyck Floors, South Africa’s eldest carpet manufacturer, and Harrismith based Nouwens Carpets will consolidate their operations in order to streamline and optimize their manufacturing and supply chains, the companies announced today (April 8). Dr Mehran Zarrebini, CEO of PFE International, the family-owned British investment company that acquired what was then Van Dyck Carpets in 2004, said that the consolidation was still subject to Competition Board approval. However, in a challenging market where carpet manufacturers not only had to contend with rocketing input costs, unreliable electrical supply and shrinking disposable income for home improvements but also competition from other flooring solutions, it made sense for the two companies to consolidate. Although specific details of the resulting restructuring of the two companies are not yet available, both Zarrebini and Nouwens Carpets chairman, Oscar Grobler, said that this would impact some of the 400 plus employees at the two manufacturing plants in KwaZulu-Natal. Nouwens, known for its quality product offering since it was launched in 1962, currently employs close to 200 people whilst PFE International has approximately 600 employees across the group in South Africa and 205 within its carpeting division. PFE International’s 40 plus years’ global experience in yarn extrusion and carpet manufacturing has stood the company in good stead. In South Africa, the group has invested more than R100-million over the past 15 years with big capital projects including South Africa’s largest state-of-the-art fibre extrusion line, a BCF twisting and heat-setting line and upgrading and modernising the tufting and needle punch machinery at the factory in Prospecton, Durban. This, together with investment in sister companies such as Mathe Group, which manufactures a range of rubber crumb products from recycled truck tyres and close associations with international brands such as artificial turf company, Easigrass, Balta, Instafloor and PERGO, the world’s leading manufacturer of premium laminates, commercial LVT/P’s and engineered wood products, has enabled Van Dyck to diversify its product offering within both the commercial and residential flooring markets. This multi-brand strategy that the combined companies intend continuing to apply going forward will allow each of them to retain their own independent brands, products and sales and marketing teams. 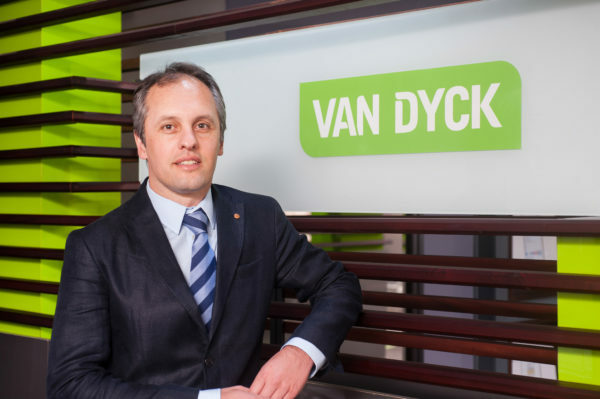 Dr Zarrebini and Van Dyck Floors, whose longer-term vision encompasses sustainability rather than short term profit, has weathered two economic recessions – the global meltdown in 2008 and the current difficulties that manifested in 2017. “Due to the economic turmoil in both the construction and manufacturing industries over the past few years and added economic pressures, a fresh approach to doing business is needed. At Nouwens, we believe this consolidation with Van Dyck Floors will be a game changer, not only for our respective businesses but also for our customers and the industry as a whole. We feel that it will add value to both of our customer bases and enable both companies to leverage each other’s strengths,” Grobler added. Dr Zarrrebini believes that the consolidation of Van Dyck Floors and Nouwens Carpets will also enhance the impact of future investment. “This consolidation will ensure that efficiencies are gained from both manufacturing operations and will enhance our ability to innovate and ultimately ensure sustainability of the soft flooring industry in South Africa”, he explained. One of the areas that will undoubtedly receive attention is environmental performance. Van Dyck Floors is ISO 9001:2008 (quality management) and ISO 14001 (environmental management) approved by the South African Bureau of Standards. It is also the only flooring manufacturer that has an ISO 14064-1 Green House Gas verification report and the first local company to achieve the Carbon Trust Standard for Carbon (the world’s leading and independent certifier of organizational carbon footprint reduction) for reducing greenhouse gas emissions by more than 40% over the past four years. “It is the mission of Van Dyck Floors to provide soft flooring that is affordable, durable and environmentally friendly. We will provide the highest quality possible through our skilled employees in accordance with our tradition of high manufacturing standards,” Zarrebini concluded. For more information, please visit www.nouwenscarpets.co.za or www.vandyckfloors.co.za. © 2019 Van Dyck Floors. Portal powered by Specifile®.